MEMU Rail Coach Factory, Bhilwara: Rajasthan's Bhilwara district will get MEMU train coach factory as announced in Rail Budget 2013-14. Railways joined hands with state-owned BHEL for setting up a modern Mainline Electric Multiple Unit (MEMU) coach factory in Bhiwara, Rajasthan. 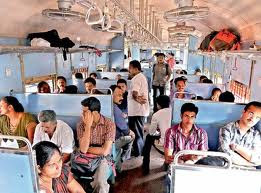 Rajasthan will give us 200 acres of land in Bhilwara for setting up the MEMU coach factory and BHEL will set up the factory which will manufacture 400 coaches in a year as per Railway Minister Pawan Kumar Bansal. MoU was signed between railways and BHEL here for setting up a Rs 1,000 cr state-of-the-art MEMU coach factory in Bhilwara, the national transporter will sign another MoU with Rajasthan for the joint venture project. MEMU trains are required for faster connectivity with suburban areas. Nine MEMU coaches comprise one MEMU train.